As previously written, I’ve been testing a Garmin Vivofit as a replacement for my Fitbit Force (and before moving on to a Garmin Vivoactive that is yet to be released in Europe). Here are some more thoughts. Vibrating alarm: waking up with a vibration in your wrist is extremely better for me than any sound alarm I’ve ever had in my life. Vivify lacks that, although lately i’ve been waking up on my own anyway so in general it’s not a big miss. Light-up screen: Garmin’s screen is not lit and unreadable at dark. Forget about checking the time during the night or in a cinema. Automatic tracking of sleep: You don’t need to do anything, it understands when you lie in bed and when you’re up. It will also track naps on it’s own. On Garmin you need set it up in sleep mode (which can be tricky a dark room in combination with unreadable-at-dark screen), although you can also enter data manually in the morning. Slightly better syncing: with Fitbit you just open the app, and providing you already have blue tooth open you don’t need to do anything else. Vivofit needs it’s button to be pressed for 2″ in order to start the synchronisation process. Then you need to open the app. Or not :) If the app is still open in the background, it will sync, most of the time. Yes, it’s not very trustworthy. No charging, ever: The battery lasts one year, then you just change it and you’re good for another year. Always-on screen: look at your wrist, your step count (or even better, your remaining step count until your goal) is right there. No button pushing required. 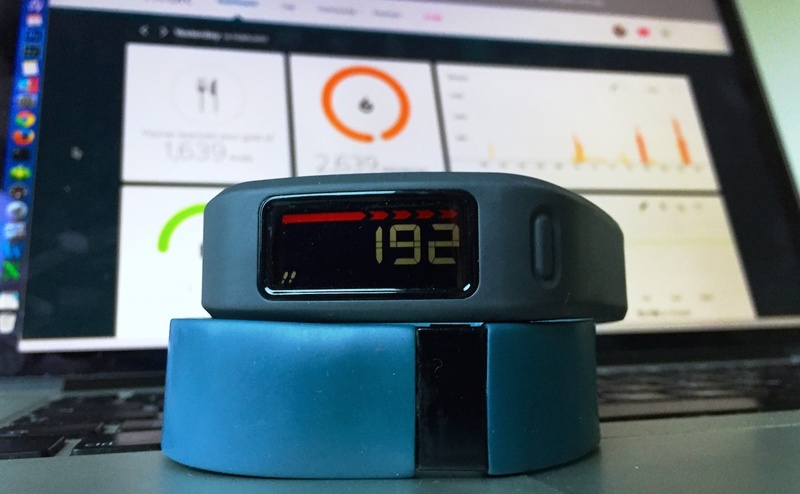 Better burned calories tracking: I’ll have the full data in another post, but it seems that Garmin’s numbers are more close to reality than Fitbit. This entry was posted on Tuesday, February 17th, 2015 at 3:32 pm	and is filed under Fun, Productivity, Technology.